The basic rieslings are all very clean and fresh examples of the variety, and possibly the best value I have tasted, particularly the Pionier 2011. Had a rich mineralic honeyed peach nose, ripeness and texture on the palate and wonderful concentration and balance. Quite closed but slightly perfumed, had some richness and savoury elements, and was beginning to pick up some oily nectarine complexity. Much quieter than the Jesuitengarten, showing more earth and citrus with a firestone warmth on the palate. 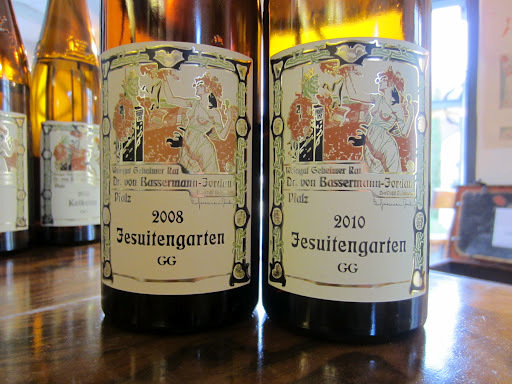 Brighter and juicier, and more approachable now than the 2010 is. It still has some of the earthy notes, but it is also picking up some subtle toasted nut complexity. Unmistakable brooding contemplative nature of other vintages and estates. After almost five years it is showing some great tertiary characters, such as a sweet oily texture, dark currant concentration and superb volume. It is not a riesling for the feint of heart. Lovely and fresh with good balance of acids and sweetness, but isn’t really a patch on the sweet wines of the Mosel. Lovely and rich golden but not at all brown in colour. On the nose there was a fascinating lemon barley cordial and orange peel aroma, along with candied ginger and blackcurrant tea. On the palate there was so much complexity it was hard to pinpoint, but I did see some caramelized onion and hard cheese in there. It was nice to take the taste of this wine with me as I said farewell.